We love prix fixe lunches probably as much as restaurants like offering them. ALL OUT (St. Clair, Trinidad) – $150 for any two entrees with a free soup or salad. Previous entree choices included Penne Pasta w/Chicken & Sausage; Classic Burger & Fries; Sirloin Steak; Fish & Chips; or Grilled Chicken Salad. (868) 628-0667. ANGELO’S ITALIAN RESTAURANT (Woodbrook, Trinidad) – $145 for two courses and a glass of Voga wine, exclusive of 15% VAT and 10% service charge. The lunch menu features seven appetizers and eight main course choices. (868) 628-5551 or 628-7854. 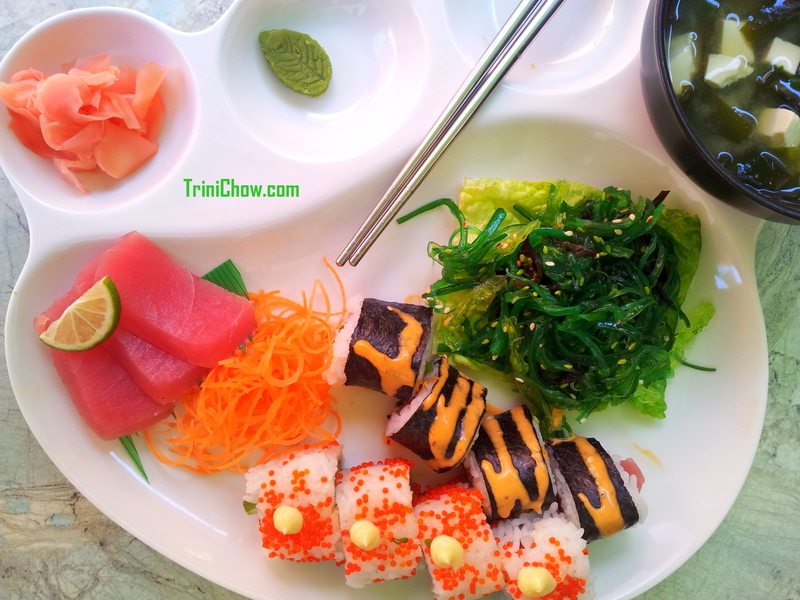 CHAUD (Port of Spain, Trinidad) – $289 for three courses inclusive of glass wine, tea or coffee and all taxes. Sample menu: starter choices of Salmon Mousse ‘Martini’ or a Pan-Asian Duck Salad; a Sugar Snap Soup; main course choices of a Thai Red Curry Beef Stew w/steamed jasmine rice, stir fried vegetables & wilted greens, an Oven-Roasted Pork Tenderloin with a three-cheese bread pudding, glazed cipollini onions & apricot gastrique, or a Grilled Fish Spiedini w/salsa verde potato risotto, vegetable étuve, yellow tomato aurora; dessert choices- a Coconut-Rum Flan w/pistachio-coconut sorbet and a tuile cookie; Banana Crumble Cake w/vanilla bean ice cream, bourbon caramel sauce, or Chocolate Brownie S’mores w/sour cream sherbet & raspberry coulis. (868) 621-2002 or (868) 621-3903 or email reservations@chaudkm.com. Link to Chaud lunch pictures. CREW’S INN (Chaguaramas, Trinidad) – $99 for main course, glass of wine and dessert, exclusive of 15% VAT and 10% service charge. A recent menu featured a Cream of Celery & Apple Soup; Bistro Salad; Bourbon Chicken w/sweet potato mash & steamed vegetables or Pan Roasted Sea Trout w/corn cakes, sauteed spinach & vegetable ribbons; Peach & Caramel Profiteroles. (868) 634-4000 ext. 424. JOSEPH’S RESTAURANT (Maraval, Trinidad) – $165 for two courses, $190 for three courses, exclusive of 15% VAT and 10% service charge. On our most recent visit, the menu offered a choice of a Greek salad, Fish Kebab or Soup of the Day (it was cauliflower that day) as an appetizer; Chicken A la Provencale, Mahi-Mahi Filet; 8-oz Strip Loin, and Homestyle Lamb; and for dessert a choice of cheesecake, creme caramel or ice cream. (868) 622-5557. 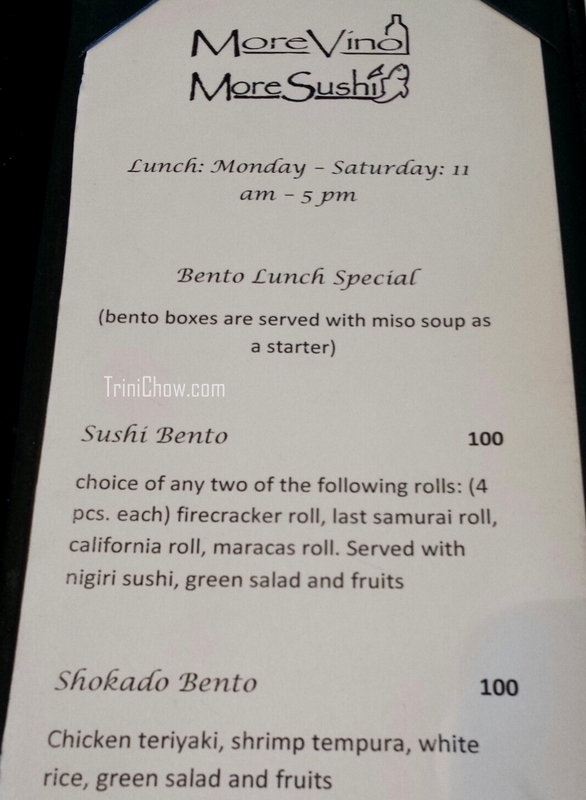 MORE SUSHI (Woodbrook and San Fernando, Trinidad) – $100 Bento Box lunch special exclusive of tax & service charge. Link to menu. Lunch Hours are 11am-5pm at both locations. (868) 622-8466. WOODFORD CAFE (Chaguanas, Trinidad) – Regular Lunch Special: $200 total for lunch for two, all taxes included. Each person can choose one appetizer, two entrees and one dessert. Monday-Friday, 11:30am-4pm. Link to flyer on Facebook with full menu. BLUE CRAB RESTAURANT (Scarborough, Tobago) – $65 for fish or chicken plate ($70 for combination of both), exclusive of taxes. The last lunch we enjoyed at Blue Crab included a delicious Grilled Fish, Rice & Dal, Plantains & Provisions, Sauteed Patchoi and Coleslaw. Link to Blue Crab pictures. (868) 639-2737. KARIWAK VILLAGE RESTAURANT (Crown Point, Tobago) – $70 for a lunch special, exclusive of 15% VAT and 10% service charge. A recent lunch menu featured a choice of Braised Fish w/fresh coriander or Nutty Chicken with Okra & Rice, Stewed Bodi Beans, Creole Sweet Potatoes and Fresh Salad. Links to Kariwak Village Restaurant pictures here and here. (868) 639-8442. REN MAR’S RESTAURANT & BAR (Pigeon Point, Tobago) – $60 lunch special includes one meat/fish/poultry item and a serving of the (4-5) sides from the daily lunch menu at this beachfront restaurant, exclusive of taxes. On our last visit, RenMar’s lunch set-up featured Stewed Goat, Baked Chicken, Curry Chicken, Fried Fish, Macaroni Pie, Callaloo, Rice & Blackeye Peas, Dumplings, Provisions, Mixed Vegetables and Fresh Salad. Link to RenMar pictures. (868) 631-8768. BAR CODE SPORTS BAR & GRILL (Scarborough, Tobago) – $60 for a special lunch plate on Fridays only, exclusive of taxes. A typical lunch menu includes a combination of fish, chicken, pork and/or lamb with sides of rice & stewed pigeon peas, fried plantain, callaloo, macaroni pie, potato salad and fresh salad. Link to BarCode pictures. (868) 635-2633. NOTE: Every effort is made to keep this list updated, but please call to confirm prix fixe menus and prices. All prix fixe menus and prices as well as the days and times are subject to being withdrawn or changed at the restaurant’s discretion. Crews Inn is not $99.00 for two course, is $199.00 for a two course meal. Please change. Hi Giselle, sorry the link was going to the dinner menu instead of the lunch menu. We’ve fixed the link so it goes to a previous lunch menu.